SAR azimuth resolution improves with the length of the synthetic aperture. In stripmap mode, antenna pointing is fixed relative to the flight line; azimuth antenna beamwidth limits the available synthetic aperture length because it determines the transit distance over which the sensor illuminates each scatterer. Spotlight mode avoids this limitation on synthetic aperture length by steering the antenna illumination pattern to illuminate the scene for a long period. Consequently, antenna beamwidth does not limit azimuth resolution in spotlight mode. For all three modes imaging, different geometries may be possible: the so called boresight imaging geometry or the squinted imaging geometry. The first one, which is known also as zero Doppler, has an average pointing of the antenna perpendicular to the flight direction. In the second one, which is known also as non-zero Doppler, the antenna has an average pointing with an offset, forward or behind, with respect to the boresight direction. When the system is operating in the spotlight (staring or sliding) mode an electronic beam steering of the antenna is adopted: the antenna radiation pattern is changed each fixed number of transmitted pulses (burst). Either due to possible spurious delays in the radiation HW, or to the introduction of delays due to the propagation through the atmosphere, or to phase delays due to the orbit curvature, phase offsets can be present on the received data from burst to burst. From this parameter we achieve the estimation of phase offsets between the looks, The estimated differential phase offsets are then integrated and phase subtracted from each burst prior to the final image focusing. The algorithm has been successfully tested on a COSMO SKYMED image provided within the framework of the COSMO-SKYMED AO Project 2103. In fig. 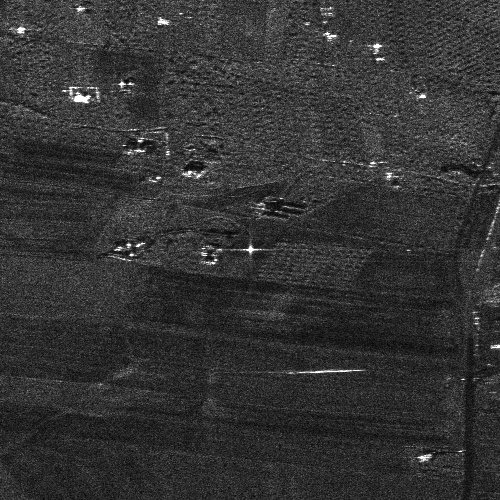 1 it is shown a zoom over an industrial area in the north of Matera (South Italy) before the correction of the phase shift. Azimuth is horizontal and on the corner reflectors, especially the brithest on at the center of the image a high level of sidelobes can be detected. In Fig. 2 it is shown the image of the same area after the estimation and correction of phase shift by using the proposed image contrast based technique: it is evident that a significant reduction of the level of sidelobes is achieved. Figure 1 - Result of the focusing of real spotlight SAR data acquired by the COSMO/SKYMED constellation acquired over the city of Matera (South Italy), before the correction of phase shifts. G. Franceschetti, and R. Lanari, Synthetic Aperture Radar Processing, CRC PRESS, New York, 1999. W. G. Carrara, R. S. Goodman, R. M. Majewski, Spotlight Synthetic Aperture Radar - Signal Processing Algorithms, Artech House, Norwood, MA, 1995. R. Lanari, M. Tesauro, E. Sansosti and G. Fornaro, ''Spotlight SAR Data Focusing Based on a Two-Step Processing Approach'', IEEE Trans. Geosci. Remote Sens., vol.39, no. 9, pp. 1993- 2004, Sep. 2001. D.P. Belcher, and C.J. Backer, ''High resolution processing of hybrid stnpmap/spotlight mode SAR'', IEE Proc., Radar Sonar Navig., 1996. R. Lanari, S. Zoffoli, E. Sansosti, G. Fornaro and F. Serafino, ''New approach for Hybrid stripmap/spot light SAR data focusing'', IEE Proceedings on Radar, Sonar and Navigation, Vol. 148, No. 6, pp. 363-372, December 2001. V. Zamparelli, G. Fornaro, R. Lanari, S. Perna, D. Reale, ''Processing of Sliding Spotlight SAR data in presence of squint'', in Proc. IGARSS, Munich, Germany, Jul. 2012. G. Fornaro, E. Sansosti, R. Lanari, M. Tesauro, ''Role of processing geometry in SAR raw data focusing'', IEEE Trans. Aerosp. Electron. Syst., vol. 38, 2002.